It is located west of the city centre at teh intersection of Unter den Linden and Ebertstraße, immediately west of the Pariser Platz. 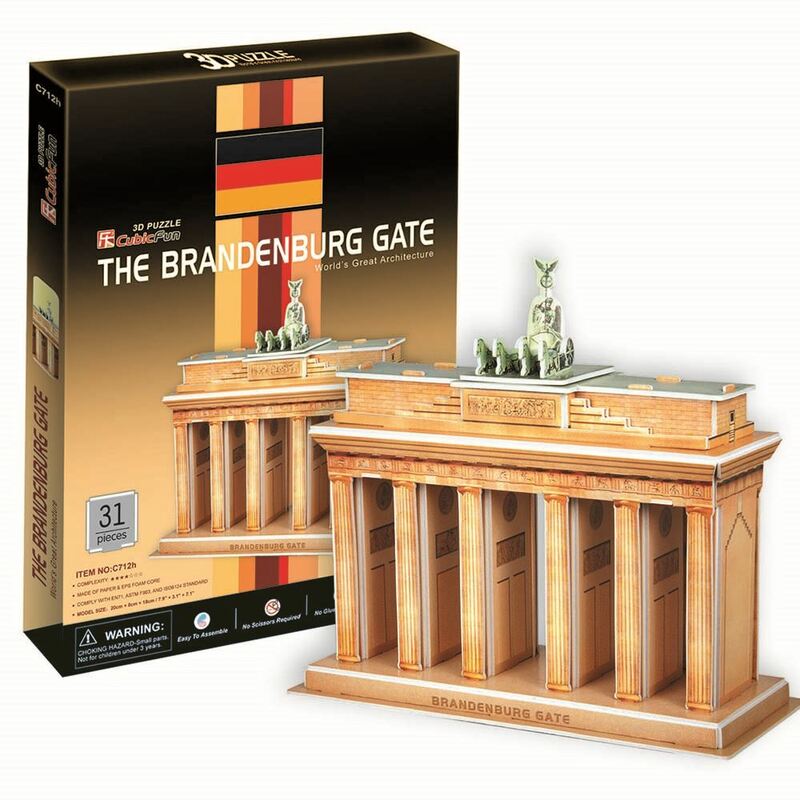 It is the only remaining gate of a series through which one formerly entered Berlin. One block to the north stands the Reichstag. The Brandenburg Gate is the monumental entry to Unter den Linden, the renowned boulevard of linden trees which formerly led directly to the city palace of the Prussian monarchs. It was commissioned by King Frederick William II of Prussia as a sign of peace and built by Karl Gotthard Langhans from 1788 to 1791. The Brandenburg Gate was restored from 2000 to 2002 by the Stiftung Denkmalschutz Berlin (Berlin Monument Conservation Foundation). Today, it is considered one of Europe's most famous landmarks. This 3D puzzle is made of paper and expandable polystyrene foam board, it is easy to assemble without the use of any tools or glue. No of Pieces: 31. Model Size: 20cm x 8cm x 18cm. Age 8+.